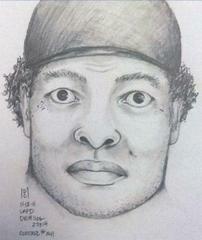 BOLO for Male, Blk, 5'9" to 6'0", stocky build with short curly hair in his mid 30's to 50's. Suspect is responsible for a series of robberies involving the use of a handgun. These series of robberies/shootings have occurred in Olympic, Hollywood, Southwest and 77th divisions. Suspect has also been observed riding a dark mountain bike during several robberies. If anyone resembling this individual is encountered/observed, please go to lacrimestoppers.com or call Olympic Area Robbery Detectives at 213-382-9470.